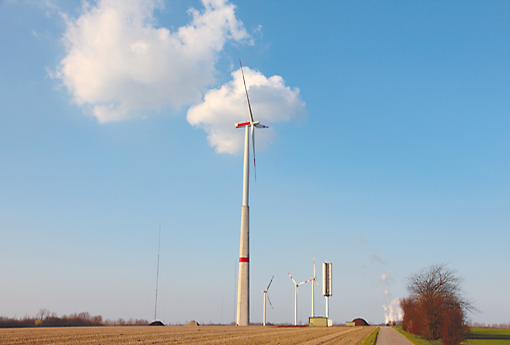 Since 1998 windtest grevenbroich gmbh has operated a test field for wind energy systems on the Neurather Höhe hill south of Grevenbroich near Neuss. Prototypes and test systems with a capacity of 600 kW to 2,500 kW are currently tested there and measured according to international standards. After completion of the work, the systems are dismantled and replaced by new prototypes. Clients and owners of the wind energy systems are generally the manufacturing companies. windtest grevenbroich gmbh provides the test field with the necessary infrastructure, the measuring technology and the services. The collected data from various measurements, such as stresses, performance curves or electrical characteristics, are used by the system manufacturers to optimise the components as well as the mechanical, dynamic or electrical characteristics of their wind energy systems. windtest grevenbroich gmbh also offers guided tours of the test field. If you are interested, please contact Saskia Brouwers.